Students have always responded powerfully to the memorable stories, poems, plays, and essays gathered in distinctive clusters in Making Literature Matter’s thematic anthology. At the same time, the book’s chapters on reading, writing, and research help students harness those responses into persuasive, well-supported arguments about the issues raised by the literature. As ever, the new edition of Making Literature Matter reflects John Schilb and John Clifford’s careful attention to emerging pedagogical needs. In response to instructor requests, the text includes even more instruction on the key skills of argumentation, critical reading, and research, while linking literature more directly to the newsworthy current issues of today in new "Literature and Current Issues" clusters. Further, they have read widely to identify the most engaging recent fiction, poetry, drama, and nonfiction, and based their new choices for the seventh edition on how well that literature explores issues that matter to students right now. Making Literature Matter is also available with LaunchPad Solo for Literature, a set of online materials that helps beginning literature students learn and practice close reading and critical thinking skills in an interactive environment. 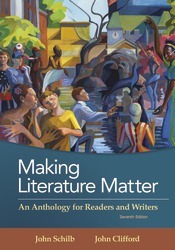 To order Making Literature Matter packaged with LaunchPad Solo for Literature, use ISBN 978-1-319-07191-2.